National Knowledge Network (NKN) project is aimed at establishing a strong and robust Indian network which will be capable of providing secure and reliable connectivity. Globally, frontier research and innovation are shifting towards multidisciplinary and collaborative paradigm and require substantial communication and computational power. 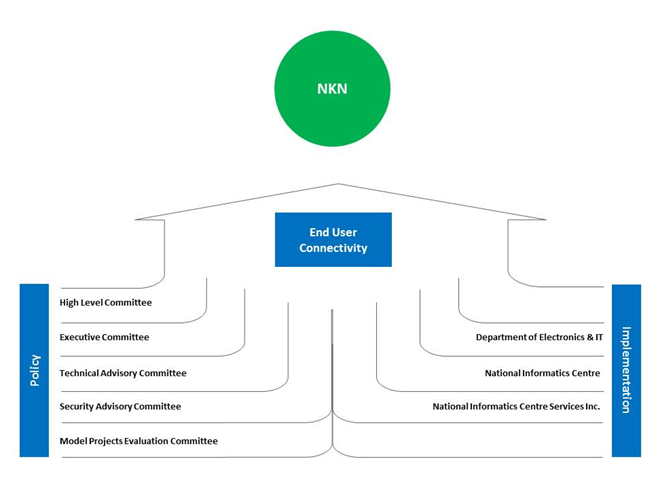 In India, NKN with its multi-gigabit capability aims to connect all universities, research institutions, libraries, laboratories, healthcare and agricultural institutions across the country to address such paradigm shift. The leading mission oriented agencies in the fields of nuclear, space and defence research are also part of NKN. By facilitating the flow of information and knowledge, the network addresses the critical issue of access and creates a new paradigm of collaboration to enrich the research efforts in the country. The network design is based on a proactive approach that takes into account the future requirements and new possibilities that this infrastructure may unfold, both in terms of usage and perceived benefits. This will bring about a knowledge revolution that will be instrumental in transforming society and promoting inclusive growth. In order to improve access to knowledge, a need has been long felt in the country to establish a National Knowledge Network (NKN) inter-connecting all knowledge and research institutions in the country through a high bandwidth network. Globally, research & development activities and innovations are increasingly becoming multidisciplinary and collaborative, and require substantial communication/computational power. For India to emerge as a significant R&D hub, it has to become a part of this wave of collaboration and co-creation. The idea of setting up of a National Knowledge Network was deliberated at the office of Principal Scientific Advisor to the Government of India and the National Knowledge Commission engagements were held with key stakeholders including experts, potential users, telecom service providers and educational and research institutions. These discussions have yielded a consensus on the optimal approach to be adopted for setting up such a network, to provide a unified high speed network backbone for all the sectors. • Facilitating advanced distance education in specialized fields like engineering, science, medicine etc. NKN is a state-of-the-art Pan-India network and is a revolutionary step towards creating a knowledge society without boundaries. It will provide unprecedented benefits to the knowledge community and mankind at large. Using NKN, all vibrant institutions with vision and passion will be able to transcend space and time limitations in accessing information and knowledge and derive the associated benefits for themselves and for the society. It will facilitate the development of India's information infrastructure, stimulate research, and create next generation applications and services. NKN is designed to provide high availability, Quality of Service, security and reliability. The purpose of NKN goes to the very core of the country’s quest for building quality institutions with requisite research facilities and to create a pool of highly trained professionals. The participating institutions at the edge would seamlessly connect to NKN at gigabit speed. NKN shall be a critical information infrastructure for India to evolve as a knowledge society. NKN is a significant step which will enable scientists, researchers and students from across the country to work together for advancing human development in critical and emerging areas. Facilitating advanced distance education in specialized fields such as engineering, science, medicine etc. Facilitating integration of different sectoral networks in the field of research, education, health, commerce and governance. Link to Global Networks to collaborate with the research communities across the globe.